Leke Robinson is living proof that some of life’s greatest successes can start by simply moving outside of a comfort zone. “Sometimes I still don’t believe it. It just doesn’t feel real,” says Robinson, a member of the Class of 2019 at Richard Bland College of William & Mary. As a high school student, Robinson (who pronounces his first name Lee-KAY) was not sure if higher learning was his future, but the Middlesex County resident did know what type of career he did not want to pursue. Neither Robinson’s parents nor his sister had pursued a college degree, but conversations with his aunt offered insight into what one could offer him. 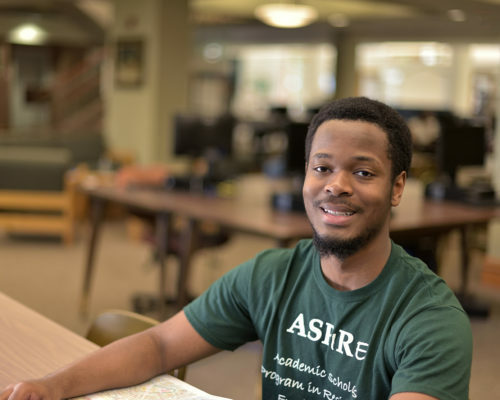 At Richard Bland, Robinson, who says he is an introvert, found a welcoming environment where he knew he could flourish academically and personally. “I come from a small area, so coming here, it being somewhat of a smaller school, was a good fit for me,” Robinson says. Robinson is a Resident Assistant at the ASPIRE Living & Learning Community and participates in its service projects, like revitalizing the nature trail on campus. As he explores these opportunities, Robinson is beyond satisfied with his decision to branch out and not default to the community college near his hometown. “I watched people go there and stay at home and never finish school,” Robinson remembers. 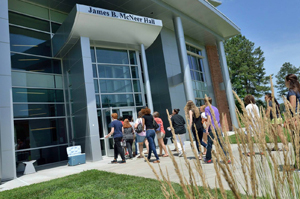 At RBC, Robinson is a Promise Scholar, which offers scholarships, mentors and courses taught by William & Mary professors on the Richard Bland campus. Through the program, Robinson has taken classes on unique topics like Rastafari and emerging diseases. He also has visited James Monroe’s Highland and toured the College of William & Mary. However, William & Mary is exactly where Robinson will transfer after graduating from RBC. As a Promise Scholar he will earn degrees at Richard Bland AND William & Mary with little to no debt. He plans to major in business and become a Certified Public Accountant. Robinson knows his evolution stems from taking chances, working hard and putting stock in his Richard Bland education. “If I had stayed in Middlesex, I think I would have missed many opportunities. It’s small. I’m glad I pushed myself to take a different path,” Robinson says.